There are many benefits of working with a contract manufacturer, which we’ve discussed in previous blogs. (You can see them here, here, here and here.) Among the benefits are gaining access to expertise, advanced equipment, facility space and a skilled labor force. And don’t forget the cost savings available due to bulk ordering materials and the establishment of a long-term partnership. Working with a contract manufacturer can help you grow your business in the most cost efficient and productive manner possible. On top of all these benefits, working with a contract manufacturer that offers product design and engineering services can confer additional advantages. Many contract manufacturers will work with you and your existing design and prototype to further develop and deliver the products you need. This service by itself is extremely valuable, especially in situations where your organization is growing faster than you anticipated, or is unable to manage market demands effectively in house. Now, imagine the possibility of working with a team of skilled product designers, as well as electrical and mechanical engineers, working together to bring your sketch or idea to fruition. Your company may already have qualified individuals working to develop the best products in your market, but you may not have a big enough or appropriately skilled team of engineers to build them. Or, maybe you have plenty of engineers, but you need a someone to further develop the initial product design before you can move to the next step. By working with a contract manufacturer that offers access to both product design specialists and experienced engineers, there is practically no problem that can’t be solved. Whether you lack sufficiently skilled engineers or product design professionals, or both, Axenics can provide it all, or only the services you need. Our team of design experts specialize in helping customers in a variety of industries to turn a great idea into an actual product, while saving our customers both time and money. It all starts with concept development. We want our customers to be involved in every stage of the process, so there are no surprises. We typically schedule several consultation meetings to discuss the needs and challenges of our customers, so we can develop the best possible solutions. Next, we work with the customer to create a working manufacturing process to build the product in the most efficient manner. We want to make sure that our process effectively solves our customer’s challenges, and that our solutions will exceed their expectations. After we’ve reconfirmed that design and the process through which it will be developed, we work with our customers to ensure the final product will meet customer specifications. We discuss the components and materials to be used to build the product, as well as how it will be manufactured, and what that means for the final design. Once everything’s a go, an initial prototype is developed. From there, the design is brought to our manufacturing facility to be produced and assembled according to specifications. No product leaves our facility until it is quality tested and approved. Customers are also given an in-depth manual for the product, backed by our support team in case of any questions or concerns. The Axenics product engineering staff consists of a team of highly skilled mechanical and electrical engineers, with more than 30 years of experience. 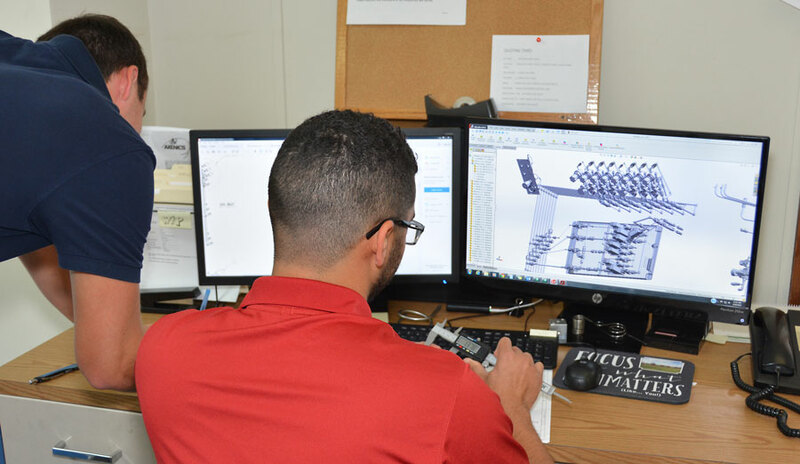 Our mechanical engineers are trained to use AutoCAD and SolidWorks 3D design software, with the ability to start with conceptual sketches and progress toward more elaborate designs. They are capable of engineering everything from complex mechanisms, to machine design, medical disposables, machine vision, and more.